Zombie Manor is a great day out for those who like horror movies, and want to experience for themselves what it is like to be part of the walking dead. 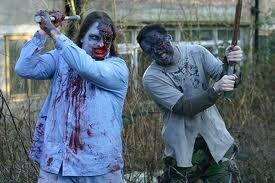 Zombie Manor House is set in 65 acres of land, and is situated in Warrington, which is between Manchester and Liverpool. When you arrive at the Manor, you will be given your weapon of an airsoft gun, and your ammo. Do not overuse your ammo though, as it comes in short supply. If you do run out, you may have to think of other ways of averting those zombies, preventing them from eating you. After you have received your weapon, you will be given training on how to use it. Experts will give you instruction in the military style and proper usage of the gun. If you do not learn how to use it properly, you may not enjoy the experience as well as you should. You will not be sent into the path of attacking zombies immediately, you will be shown a plot, so that you can follow a planned storyline. Having a story to follow, just home, by providing them with financial help. This help was an agreement to let them use the manor for scientific experiments. Here the scientists tested new weapons and like on the real Walking Dead, will be so much more fun than just shooting at zombies randomly. The whole story will take about three hours for you to complete, and hopefully you are still alive at the end of it. Years ago when the manor house was first inhabited it was owned by a family that liked to party. Sadly, they lost their wealth, and the government offered to save their drugs, until one day it all went wrong. The guests at a particular party that was held there by the family, started to get an increased desire for flesh, which led to their hunt and search for more food. This of course, turned more people into zombies, increasing their population. We don’t want to give too much away, as it would spoil your fun. If you would like to experience this for yourself, gather your friends and book your amazing day out. You don’t want to drive there yourself, because if you get lost along the way, you will be late and miss all the fun. So, why not let minibuses Bolton provide the vehicle and a driver to get you there. We have planned the quickest and safest route, to take you and will be waiting to pick you up when it’s all over. For this trip, it will cost you £140, which includes the return journey and a minibus that seats up to 16 passengers. What are you waiting for; book today.